From the 1890s to the 1930s in Macon, Georgia, a black handyman named Leo Moss was a pioneer of black dolls. He painted doll faces black with chimney soot and had his wife design their clothes. Their papier-mache heads were made out of scrap pieces of wallpaper he collected on odd jobs he performed for white families. Every single doll was unique, created in the images of family and friends. Now, the largest collection of rare Leo Moss dolls is in an exhibition at the Charles H Wright Museum of African American History in Detroit. “I See Me: Reflections in Black Dolls” traces the history of black dolls, from porcelain to collectibles and plastic toys. Alongside the 16 Leo Moss dolls are 138 others, including antiques, black Barbie and even some celebrity dolls – created in the image of Serena Williams and the Obama’s – which are on view until 25 June. The chronological exhibition starts with a photo of a wooden paddle doll from ancient Egypt, which dates back to 2000 BC, and a Milliner’s model doll, from 1850. The dolls showcased are on loan from 25 collectors alongside the museum’s own collection, showing the evolution from African dolls to American dolls from the 19th and 20th century to the present day. One rare doll is a “Frozen Charlotte”, a porcelain doll popular from 1850 to 1920 –black versions are very rare. “Fewer were made and few survived their original intent, whether it was for child’s play or mini mannequin use,” said Debbie Behan Garrett, a doll expert who wrote The Definitive Guide to Collecting Black Dolls. “I view these dolls as the Barbies of their time period, dolls designed to wear the fashions and hairstyles of the era.” (The Guardian, 25 April 2017, an article by Nadja Sayej). The museum is also showing Topsy-Turvy dolls, two-headed dolls popular during the time of enslavement. On one side, there was a white doll, on the other, a black doll. Some doll collectors speculate they were meant for black children who wanted a “forbidden” white doll, or that the black doll represented the “mammy” to white children. Black dolls were mass-produced in the 20th century, as American manufacturers started creating the first commercial rag, stuffed and black plastic dolls. In the 1950s, as Beatrice Wright Brewington, a black entrepreneur, founded B Wright’s Toy Company, black dolls entered the global market. Another early black doll company owned and operated by African Americans was Shindana Toys, founded in Los Angeles in 1968. Louis Smith, the company’s president, once said in an interview that self-love was an important part of creating black dolls. “We believe that only by learning to love oneself can one learn to love others,” he said. The exhibition also features a selection of Barbie dolls made by Mattel, including one plus-size doll. The exhibition offers insight not only on how children see themselves, but how they bring their own self-confidence into everyday life. 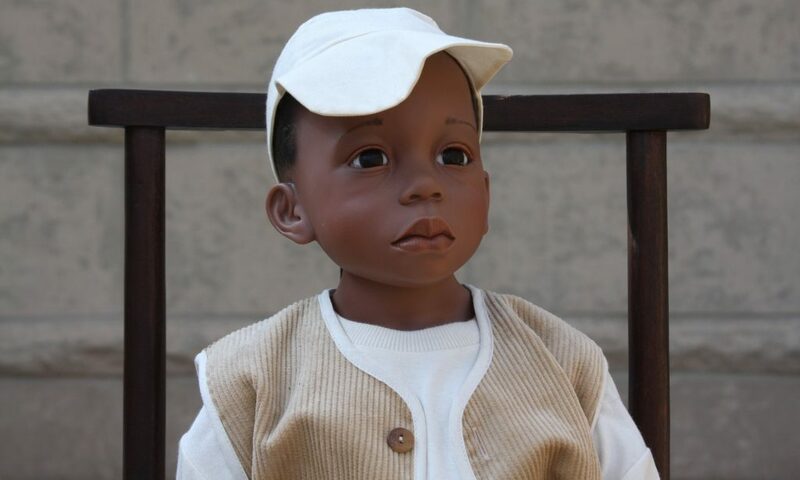 “Black dolls have been created in the likeness of past and present historical figures which have played an important role in society,” said Garrett.